A leg of lamb roast comes from a sheep that is less than a year old. Leg of lamb roast is considered a lean cut of meat, meaning it has a low fat content. When choosing your roast, select a cut that is rosy red in color and cook it until it reaches an internal temperature of 145 degrees. Most adults need no more than 5 to 6 oz. of meat a day, according to the U.S. Department of Agriculture. When watching your calories, use a food scale to keep meat portions under control. If you do not have a food scale, use a deck of cards as a reference to help you portion your meat. A deck of cards is equivalent to about a 3 oz. portion of meat. A 3 oz. portion of leg of lamb roast contains 155 calories. 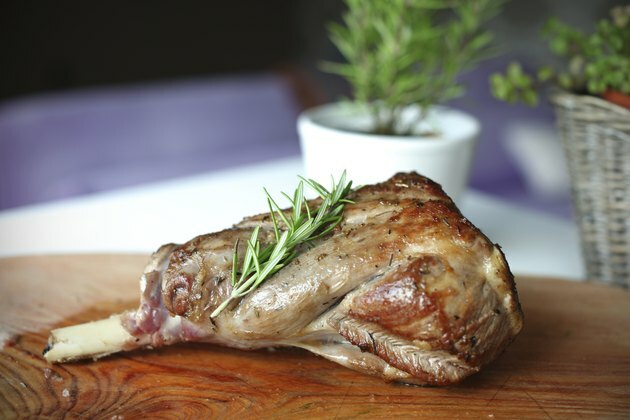 As a meat, lamb acts as a complete source of protein meaning it contains all of the essential amino acids. A 3 oz. portion of leg of lamb roast contains 23 g of protein. Most Americans get more than enough protein in their daily diets, according to the Centers for Disease Control and Prevention. Healthy adult women need 46 g of protein per day, and healthy adult men need 56 g of protein each day. A leg of lamb roast is a lean source of meat which means it is lower in fat than other cuts of meat. A 3 oz. portion of leg of lamb roast contains 6 g of total fat, 2.5 g of saturated fat and 71 mg of cholesterol. For heart health, you should limit your total saturated fat intake to less than 7 percent of total calories and cholesterol to less than 300 mg a day. High intakes of saturated fat and cholesterol can increase your blood cholesterol levels and increase your risk of heart disease. Choosing more lean cuts of meat can help you reduce you risk. A leg of lamb roast contains essential vitamins and minerals including iron, zinc and the B vitamins. A 3 oz. portion of leg of lamb contains 1.8 mg of iron and 4 mg of zinc. Iron plays an important role in oxygen transport, and zinc is needed for immune health and the synthesis of protein in the body. The B vitamins include a group of eight different vitamins that help metabolize food into energy.